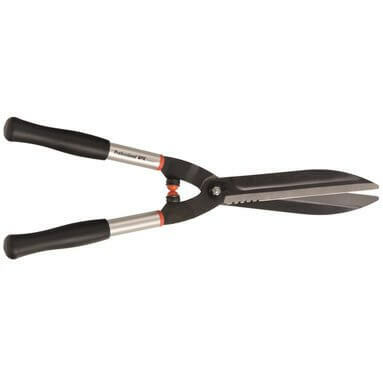 Bahco super light hedge shears - ideal for professional use in parks, topiary gardens and nurseries. Features a comfortable and lightweight design that provides a superior cutting performance every time. Comfortable and lightweight design with strong aluminium handles and smooth plastic grips. Fully hardened and sharp blades guarantee a continuous, clean cut. Serrated edge of blade provides easier cutting of thicker branches.